Leopard Gecko, refusing to eat or just picky? Thread: Leopard Gecko, refusing to eat or just picky? My a little over two year old Leopard gecko's last biggest meal was sometime in February. She didn't eat anything for months but still acted healthy and normal and didn't lose too much weight, her sheds were fine too. I thought this was normal gecko mating season behavior even though she was never gravid. After the mating season she still wouldn't eat, she would look interested with "hunting face" but then look away. Up to this point her diet was mainly mealworms, superworms and crickets, so I bought some new feeders, first I tried butterworms, which she ate two of, then a few days later she had a small cricket. She then would look interested in the buttetworms and crickets but wouldn't eat them. I then bought hornworms and she wouldn't eat any. A few weeks passed with no luck. Like I said earlier she has displayed normal happy/healthy gecko behavior and one day she wanted to come out of her tank, I held her for a bit, then set her in a larger container on the floor, where I put a superworm in, and she ate it! I have done this two other times now, have gotten her to eat a cricket and superworm, she no longer will do this either. She had another cricket in her tank a few days later. I bought dubia roaches and she refuses to eat them too, but she did eat a cricket. I don't know what to do, she'll look interested but won't eat? She is still a healthy weight but her tail obviously isn't as thick as it used to be. Last edited by Yoinks; 09-13-2018 at 01:04 AM. You can try hand feeding, where you hold the gecko and gently push a feeder at her mouth. You may want to consider a Reptile vet visit as well. She ate a superworm and a dubia roach but only when I gently opened her mouth for her, when they were in her mouth she didn't spit them out at all and afterwards she had her hunting face on for another superworm but wouldn't eat it, all she did was lick it. I'm worried this stressed her out, she seems fine and wasn't trying to get away at all and her breathing was normal but I don't know, I don't want to have to force feed her :/. Is there anything else I can do? I am a minor with no job so I'd want taking her to the vet to be a final option, if she does need to go I will of course save up money and take her. 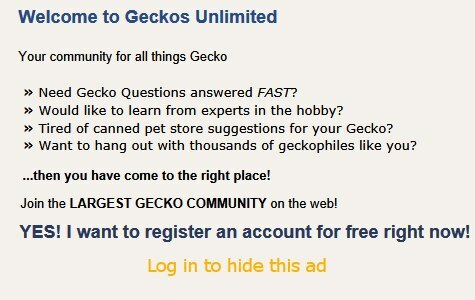 Welcome to Geckos Unlimited to you and your 2+ yo leo. Hopefully the superworm and dubia that she just ate have given her a good taste of "what's out there". Her tummy may be a bit full after that meal, especially since she's been off food for a while. Please share current photos of your leo and of her setup. Which supplements do you use? Please share brand name(s), product names, and frequency of use. You're doing great offering her a variety of feeders! That spices up her diet. Last edited by Elizabeth Freer; 09-12-2018 at 01:38 PM. Her supplements are zoomed repti calcium with d3 and one without, she also has national geographic multivitamins. When she ate regularly I dusted her food after every other feeding, but when she slowed down I gave her a bigger calcium dish without d3 and dusted some of her hides with a bit of the d3, she uses her dish regularly and will sometimes lick her hides. She had a feeding dish when she was younger but preferred being fed with tweezers or trying, keyword trying to hunt, I put in the plastic thing in her tank yesterday to she if she would eat any of the worms or roaches, she went over to it but didn't eat anything. She has been more active and happy today and attempted to hunt a roach in her bowl, but failed, but she did eventually eat it after I held her in my hand again. You're welcome! I'm totally sorry for my long delay getting back with you. Can we carry on from here? Your 2 yo leo seems well-proportioned. She's a good weight for her length. How's she been doing recently? It's important to elevate the enclosure at the corners and in the middle with something like small tiles, dominos, or wooden blocks. That provides necessary ventilation for the heat mat. Otherwise heat can build up and scorch wooden furniture. That heat build up could be a fire hazard. A single Pangea feeding was all it took. Now he's eating crickets again. I recommend Zoo Med's Reptivite multivitamins without D3 instead of National Geographic multivitamins. Recommendations for leopard geckos 12-18 months old depend upon how well your leo has grown thus far. Last edited by Elizabeth Freer; 09-19-2018 at 06:23 AM.